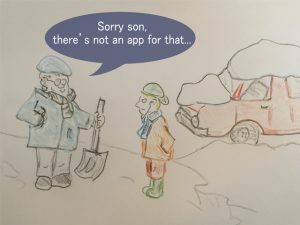 Well it appears it’s definitely on its way, snow, ice and freezing temperatures, with it bringing risks of trips and falls just going out, however there is also a hidden danger from getting out the shovels to shift snow. Shovelling and scraping snow away can cause a few injuries, though most commonly backpain, there several reasons for this such as we don’t do it often therefore not prepared for the physical work, the snowy surface makes the job unstable, often we make do with a poor shovel or those little hand shovels from the kitchen something I can’t deny using myself. So what can you do to look after your back as the snow arrives? Before you dive into it, consider how much snow there is, consider the amount of work and time needed and your fitness, then plan accordingly taking breaks and looking after your body. There is no point clearing the drive then having to spend the next two days lay on the settee with backpain. Leave the kitchen stuff in the kitchen, don’t use the old heavy shovel from the shed, consider getting a shovel fit for purpose, something that adjusts and fits you. You don’t want to be leaning over too much you want something that allows a strong solid a stance, without over bending your knees and back excessively. This may sound odd or obvious to some, but you are going out into the cold often first thing in the morning going to work or school, get your body moving comfortably treating it like an exercise, shoveling snow is hard so be prepared. Lie on your back, bend your knees then allow them to drop left and right together to create movement into the middle back and lumbar spine. As you will be bending forward and backwards while shoveling try a few toe touches and then slowly roll back upright then to reach high with your arms, always keep your core muscles engaged, if this is difficult start from a seated position rolling forward to allow your hands slide down your legs and then roll back to reach up, remember if you are feeling twinges in your body it’s probably not a good idea to shovel snow as the risk of injury to your back is high. A great exercise to work the legs and hips is to squat, not all the way down to the floor but to a chair, on reaching the chair then come up gently turning your upper body slight one way so to put a little rotation into your hips and back working left and right, this helps prepare for the twisting motion when shoveling. There are many exercises you can do, simply bear in mind the activity of shoveling and make sure to cover the major muscles and joints; 10-15 minutes should be enough to get a little looser and more mobile. Don’t rush and lift too much, small movable loads. Trying pushing the snow away rather than dig, left and throw. Take a good stance that you are strong in, i.e. like the fighting stance of a boxer or judo player, knees slightly bent, and also bend at the hips not your back, engage your core muscles to help keep your back strong but allows some movement and minimise any excessive bending action form the back. Heavy lifting with excessive twisting is a definite no, light movable loads, without reaching too far and use the whole body to pivot not your spine, don’t try and launch the snow to where you want it, move and drop. Keep warm, especially if it’s a long task at hand, using your outdoor clothing that keeps you comfortable but allows moisture to escape. Slips and falls are a risk so wear the right footwear, use ice/snow grips for you boots to give grip and balance; these are available in most shops that do outdoor equipment. If you have a supply of rock salt use it, prepare the area for snow by sprinkling it about in anticipation of snow and also use it while you are working to give grip. Taking simple actions to look after your back will help keep you moving, shoveling snow is not a good activity for many people so look after yourself and be prepared. If you really don’t like the prospect of shoveling snow try and get someone else to do it.